An unprecedented transformation of Saudi Arabia’s economic future is underway with recently unveiled plans to establish a $2 trillion sovereign wealth fund secured by state-owned giant Aramco as a key pillar of this new strategy. A fuel storage tank at the Saudi Aramco Shell oil refinery in Jubail, Saudi Arabia (AP Photo/Hasan Jamali). An unprecedented transformation of Saudi Arabia’s economic future is underway with recently unveiled plans to establish a $2 trillion sovereign wealth fund secured by state-owned giant Aramco as a key pillar of this new strategy. Saudi Arabia’s Deputy Crown Prince Mohammed bin Salman (MbS) announced in a wide-ranging interview with Bloomberg on April 1 that the government plans to use a share offering in Aramco to sharply increase the value of the country’s Public Investment Fund. The PIF could become one of the largest investment funds in the world following an initial public offering of Aramco. As currently planned, the IPO would be for “less than 5%” and listed on the domestic Tadawul stock exchange in 2017 or 2018 at the latest. MbS estimates the value of the fund could exceed $2 trillion. “IPOing Aramco and transferring its shares to the PIF will technically make investments the source of Saudi government revenue, not oil,” MbS said. Saudi Arabia embarked on an aggressive new strategy of economic reforms and transformative policies in the past year in the wake of the 60 percent drop in global oil prices since mid-2014. The goal is to enable the country to diversify its investments in non-oil entities both domestically and globally. “What is left now is to diversify investments. So within 20 years, we will be an economy or state that doesn’t depend mainly on oil,” MbS said. Saudi Arabia’s existing PIF launched its sovereign wealth fund with assets of $5.3 billion in 2008 but is dwarfed by its Gulf neighbors’ more robust investment vehicles. Kuwait launched the world’s first sovereign wealth fund in 1953, and today the Kuwait Investment Authority’s assets are estimated at just under $600 billion. The Abu Dhabi Investment Authority was launched in 1976 and has an asset base of between $750 billion and $800 billion. The Gulf state’s sovereign wealth funds are designed to invest oil income in non-oil global financial instruments, stocks, companies, or real estate as a means to diversify the state’s income sources, hedge against oil market volatility, and create long-term, non-oil investment returns for future generations in a post-oil era. Saudi Arabia’s PIF foreign asset base is pegged at just 5 percent but plans are to increase that share to 50 percent by 2020, Yasir Al Rumayyan, the fund’s secretary-general said in an interview with Bloomberg. The PIF has been quietly ramping up its operations since 2015, in part due to criticism that the fund has been too conservative with investments and that they are largely domestic. The fund has been hiring specialists in international markets, private equity, and risk management, according to Al Rumayyan. The share offering of Aramco, with its massive cash injection, will play a pivotal role in turning the PIF into a world-class investment fund for future generations. The ambitious plans for a sovereign wealth fund and share offering in Saudi Aramco are being orchestrated by MbS as head of the Council for Economic and Development Affairs. CEDA, which replaced the Supreme Economic Council in 2015, has already instituted policies aimed at curbing spending by reducing subsidies for fuel and electricity and capping the deficit at 15 percent of gross domestic product – all part of a broader plan to counter the budget crisis brought on by lower oil prices. MbS used a broad brush when announcing the plans for a share offering in Aramco, making it nearly impossible to assess the value of the planned IPO at this early stage. MbS introduced the prospect of an Aramco IPO in an interview with The Economist on January 4, with speculation rife that Saudi Arabia’s coveted oil reserves would be part of the offering. However, Khalid Al-Falih, Aramco’s chairman of the board of directors, clarified in an interview on Al Arabiya television in late January that oil and gas reserves would not be included in the IPO. “What will be offered is the economic value of Saudi Aramco and not its oil reserves,” Al-Falih said in the interview. “The oil reserves belong to the state. Therefore, we will offer the ability of the company to produce from those reserves,” he explained. MbS elaborated on the Aramco IPO in the latest interview with Bloomberg, saying “The mother company will be offered to the public as well as a number of its subsidiaries.” This imprecise language has again raised expectations that the country’s oil reserves would be part of an IPO. For international investors, inclusion of the country’s prized reserves is key. Saudi Arabia has historically guarded its reserve base as a state secret and therein lies a problem for assessing a value – the lack of transparency that is part and parcel of a state-owned enterprise. 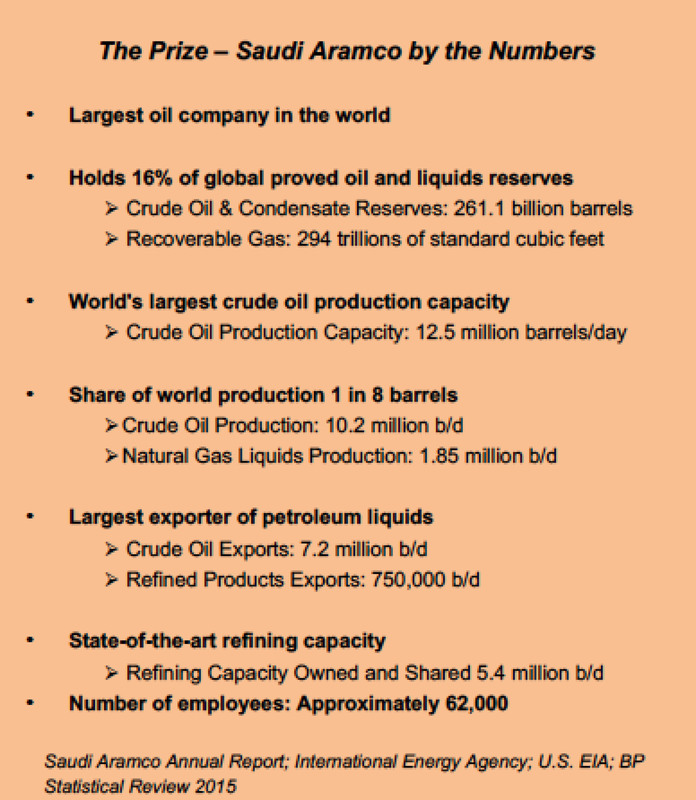 Aramco includes an estimate of around 260 billion barrels for its reserves in its annual report but that figure has not been updated in more than 25 years. (In comparison, U.S. reserves stood at 39.9 billion barrels as of 2014.) Since the early 1980s, after the government assumed full control of the company from its partners, field and reserve data have been withheld from the public domain, leaving outside experts unable to verify the country’s reserves. An IPO would notionally oblige the government to provide more transparency on its opaque oil reserves, something many veteran Saudi observers doubt will be forthcoming. The market uses booked reserves as a key measure to assess the value of international oil companies such as Exxon and Chevron. Without access to verifiable data, the investment community would be hard-pressed to place a comprehensive value on Aramco assets. Technically, however, Saudi Arabia’s crude oil reserves are owned by the government, not Aramco. Any IPO of Saudi Aramco would likely include some mechanism to book oil and gas reserves for financial reporting purposes, though the oil in the ground remains the property of the Saudi state. Yet it is not implausible that as part of the process of developing the IPO the new regime may finally lift the veil on the country’s reserves and put an end to decades of speculation. Indeed, a new level of transparency will be a financial imperative in whatever form the final share offering takes, not least because Saudi laws require financial audits for stock listings. The task ahead of preparing for an IPO is daunting, especially for a company like Aramco that has never before even officially reported revenue. Saudi Arabia’s sale of shares in Aramco could lead to a publicly listed company valued in the trillions, with some estimates as high as $10 trillion. This compares with Exxon Mobil, the largest publicly traded oil company, with an estimated market value of $332 billion on average in first quarter 2016. While the prospect of a share offering has been mooted over the past year, serious studies have yet to be undertaken. With new urgency, in late February the government issued tenders for bids to consultants to study various scenarios for an IPO. Options include, but are not limited to, selling shares in the parent company that would include producing assets, creating holding companies for various asset groups such as refineries, or selling shares in existing joint ventures. While estimates of trillions of dollars are making headlines, a parcel package of assets is expected to fall in the smaller $100 billion to $500 billion range, which would still make for a world-class offering. The record-breaking share offering of Alibaba in 2014 was valued at $170 billion. The unprecedented size of the potential IPO will require an enormous effort that could take 18 to 24 months, if not longer, given the imperative for an unprecedented level of financial and operating data transparency. Equally, the sensitive nature of putting the family firm on the block will require deft, behind-the-scenes politicking to gain much-needed political goodwill among the various factions of the royal family. Recent public statements by MbS about the need for transparency and for rooting out corruption no doubt rankled some family members and sparked concern about future largess from the monarchy. Current funds for the royal family are reportedly channeled from Aramco to the king’s executive office, the Royal Diwan. One option under an IPO scenario could involve allocating shares to the Royal Diwan or even buying a portion of the shares issued by Saudi Aramco. A restructuring of Aramco, expected to be announced by mid-year, may provide further clarity ahead of the IPO. “We will also announce Aramco’s new strategy and will transform it from an oil and gas company to an energy/industrial company,” MbS also told Bloomberg. In 2015, Aramco was brought under the broader umbrella of the Council for Economic and Development Affairs, separating the state oil company from the Ministry of Petroleum and Mineral Resources. As part of the restructuring, the company was placed under the control of a newly created Supreme Council for Saudi Aramco, also chaired by MbS. Saudi Aramco’s operations are ranked as the best in class and run by top technocrats, which will underpin any change in strategy. Ironically, however, the long lead time needed to develop and execute what could be the world’s largest IPO may be useful for a country that has always taken a conservative, go-slow approach, allowing the executives in charge time to navigate the complex financial mechanisms and sensitive family issues. In any event, with oil prices at near 12-year lows, there is little incentive to hurry the process near term.